For other uses, see Port Talbot (disambiguation). Port Talbot (/ˌpɔːrt ˈtɔːlbət/, UK also /pɔːr-, pə-, -ˈtælbət, -ˈtɒlbət/) is a town and community in the county borough of Neath Port Talbot, Wales. It is 7 miles (11 km) to the east of Swansea across the Swansea Bay, with a population, in 2011, was 37,276. It is best known for Port Talbot Steelworks, one of the biggest in the world, which employs an estimated 10% of the town's population. The steelworks has for many years been under threat of closure. Modern Port Talbot is a town formed from the merging of multiple villages, including Baglan, Margam, and Aberafan. The name 'Port Talbot' first appears in 1837 as the name of the new docks built on the south-east side of the river Afan by the Talbot family. Over time it came to be applied to the whole of the emerging conurbation. Ffynnon Pedr is a sacred spring or well which flows from the hillside through a 40 cm × 40 cm (16 in × 16 in) stone culvert in Margam. This may have been a water supply for Margam Abbey 0.75 kilometres (0.5 mi) to the East. The Cross of Brancuf an early Christian Sculptured Stone which stands in the church of St Catharine at Baglan. It is an intricately sculptured cross-slab with a Latin cross and an inscription recalling Brancuf. Originally it stood in the old St Baglan's church but that fell into ruin in the late 19th century and the slab was removed to St Catharine's. St Baglan (Bagelan), son of King Ithael Hoel of Brittany, was a 6th-century hermit and follower of St Illytud. He founded the first church at the town that now takes his name. In the vestry of St Catharine's church a cross-slab dating from the 8th-10th century CE. It is intricately decorated with a Celtic-style cross formed out of knotwork (cord-plait knotwork) and interlacing; the ends of each arm are probably of a Latin design. Also, there is a Latin inscription: FECIT BRANCUF or perhaps BRANCU which when translated reads 'was made by Brancuf'. However, the person known as Brancuf is unknown. The English antiquarian John Leland made an extensive journey through Wales c.1536-39 of which he recorded an itinerary. He passed through Aberafan, which he describes as a "poor village" surrounded by barren ground, though he also describes the area as heavily wooded, not much of which remains today. He mentions the use of the river mouth as a port. His portrayal of Aberafan as a small, struggling village suggests that the port was not in great use, especially as traffic to and from Margam Abbey would have ceased following its dissolution in 1536. The area of the parish of Margam lying on the west bank of the lower Afan became industrialised following the establishment of a copperworks in 1770. The Afan was diverted and a dock was opened in 1839 named for the Talbot family, local landowners who were related to the pioneer photographer, William Henry Fox Talbot. The Talbots were patrons of Margam Abbey, and also built Margam Castle. Christopher Rice Mansel Talbot (1803–1890), a Liberal Member of Parliament for Glamorgan from 1830 until his death, saw the potential of his property as a site for an extensive ironworks, which opened in early 1831. The remains of a Chain Home Low early warning radar station are situated in Margam Country Park, dating from World War II (c. 1941-1943). Designed to guard against enemy surface craft and submarines in the Bristol Channel, the station comprises three squarish concrete buildings with flat roofs, set on the Margam ridge facing south-east and overlooking the Channel. The most north-westerly building retains the framework of a steel gantry, the base for a rectangular radar transmitter/receiver array, known as a 'bedstead array' from its wires and framework, and is believed to be a unique survivor within the British Isles. In 1970 a new deep-water harbour was opened by Queen Elizabeth II and the Duke of Edinburgh. This harbour was capable of discharging iron ore vessels of 100,000 deadweight tonnage (DWT), a tenfold improvement on the old dock. By the early 21st century, due to further modification and dredging, the harbour is capable of harbouring vessels of over 170,000 DWT. The borough of Port Talbot was created in November 1921, incorporating Margam, Cwmafan and Aberafan. It was therefore 85 years after the phrase 'Port Talbot' was first used that it became officially recognised as the town's name. Port Talbot was part of the historic county of Glamorgan. The 1974 county council re-organisation split Glamorgan into three new counties, and Port Talbot became one of the four districts of West Glamorgan. Following the demise of West Glamorgan County Council in 1996, Port Talbot borough council was merged with Neath and part of Lliw Valley Districts to create the new unitary authority of Neath Port Talbot County Borough. The Civic Centre is located in Port Talbot, and the town is represented by three of the 64 councillors that make up the county council. The centre of the town is covered by the Port Talbot ward for local council elections. The town is built along the eastern rim of Swansea Bay in a narrow strip of coastal plain surrounding the River Afan estuary. Swansea is visible on the opposite side of the bay. The local beach is known as Aberafan Sands and is situated along the edge of the bay between the River Afan and the River Neath. The other beach in Port Talbot is Margam Sands, popularly known as Morfa Beach. The north-eastern edge of the town is marked by the River Neath. A landmark in the town is the Port Talbot Steelworks. With heavy industry and an urban motorway, Port Talbot was reported as having the worst air pollution in Wales in 2005 with a PM10 particulate level of 30 μg/m3 (micrograms per cubic metre). By 2018 the air quality had improved to meet the WHO's recommended limit of 10 μg/m3. 63% of Port Talbot population in 2000 was between the ages of 15 and 64. Male unemployment in 2000 was around 9%, with female unemployment around 6% in 2000. Port Talbot has a variety of bedrock and drift types. South East of Port Talbot is dominated by Pennant sandstone which forms this high relief area including Mynydd Margam, Mynydd Dinas and the other mountains. The pennant sandstone is made up of two formations which are the Rhondda Member and Brithdir Member. The sandstone formed in Carboniferous swamps 300 million years ago. Pennant sandstone is a micacous sandstone which has a brown colouration with areas of red staining where iron from pyrite in coal has weathered creating a rust colouration. Lower land areas are predominantly Pennant sandstone within the South Wales Coal Measures Group. There is a variety of drift deposits in Port Talbot. Sandfields area of Port Talbot is built upon blown sand and tidal flat deposits. These were deposited by the wind via aeolian processes and the water by fluvial processes. Velindre area of Port Talbot is built upon an alluvial fan deposit. This deposit formed during the last glacial period 14,000 years ago. Baglan Road in Port Talbot is built upon glacial till from the Devensian period. Till, also known as boulder clay, is a mix of unconsolidated sediment with a range of grain sizes. This forms as the fronts of glaciers rapidly deposit material due to melting. Cwmafan in Port Talbot is built upon alluvial and glaciofluvial deposits, formed from glacial meltwater. Baglan Moors, Fairfield and Port Talbot town centre are built upon tidal flat deposits (tides were higher 12,000 years ago allowing sandy deposits to accumulate). Coal seams within the Pennant sandstone run north west-south-east and east-west. The coal seams arise from the South Wales Middle Coal Measures Formation, South Wales Upper Coal Measures Formation, South Wales Lower Coal Measures Formation, Rhondda Member and Brithdir Member. Pennant sandstone is an excellent construction rock and road stone. Faults have an orientation of North West-South East, East-West and North-South. All are normal faults which form extension processes. There are also many marine fossils bands. Marine fossils found in Port Talbot region include species of bivalves, gastropods and brachiopods. Terrestrial fossils include fern tree branches, trunks, leaves and roots. Traces of organism footprints can also be found. The drift geology average thickness is between 3 to 20 metres (10 to 66 ft). Several landslips occur in the highlands including many bole holes historically made for the construction of the M4 motorway, steelworks and coal mines. Rivers in the region are fault guided meaning that they flow is highly influenced by a structural weakness called a fault. Several natural springs occur in the highland regions with a neutral to slightly acidic ph values. Natural groundwater levels varies from 10 metres (33 ft) below the Taibach area of Port Talbot to over 20 metres (66 ft). Rivers in the region including the River Afan (Aberafan), River Neath (Baglan Bay), Ffrwd wyllt (Taibach), Arnallt Brook (Taibach), Baglan Brook (Baglan) and other rivers are fast flowing and are highly influenced by their mouths (end of the rivers, tidal region). A spout can be found in Baglan Park in the Baglan region of Port Talbot. Many open and uncovered reservoirs exist in the region. Water has been channelled into ditches in industrial areas of Port Talbot. Port Talbot sea floor topography ranges from 0 to 15 metres (0 to 50 ft) within Swansea Bay. There are many patches within the bay including the North Kenfig patches, green grounds, outer green grounds, madjoe and stalheim. These patches are created from faults, hollows, general topography and other factors. Sea depth around Port Talbot is 10 to 50 metres (35 to 165 ft) with increasing depth with increasing distance from the coast. There are two beaches within Port Talbot: Aberafan and Morfa. The sand at both beaches is yellow and semi-shell rich. The tide in the area has a harmonic prediction which means it can be predicted easy and has repeatable tide heights every year. The outer bay area and sea area near Port Talbot Pier has a tidal stream with no harmonic prediction. A tidal stream (or tidal current) is an alternating horizontal movement of water associated with the rise and fall of the tide caused by tide-producing forces. This means that the tide cannot be accurately predicted due to additional factors like currents, rip current, river mouths and precipitation. There are also two major dumping grounds within the bay. These are areas were sand is collected for the construction industry. Port Talbot docks is a deep water harbour which allows large cargo ships to dock into the area. Glan Afan Comprehensive School and Sandfields Comprehensive School closed in 2016. A campus of Neath Port Talbot College is located in the Margam area. The Margam campus was previously called Afan College. The University of South Wales has a campus at Baglan Energy Park which includes a Renewable Hydrogen Research and Development Centre. The South Wales Miners' Museum is located in Cynonville, Cymmer. The nearby Margam Stones Museum has early Christian inscribed stones and Celtic crosses, including four from the area now under the Steelworks. A Roman milestone, an 8th-century pillar, and two Celtic crosses from the 10th century were all rescued from the steelworks site by the Talbot family and taken to Margam, where they are now in the museum, in the care of Cadw. The area is served by several radio stations: The Wave (96.4FM), Swansea Sound (1170MW), Nation Hits (102.1FM), Real Radio (106.0FM) and Nation Radio (107.3FM), all of which are available on DAB. Radio Phoenix also operates a 24-hour hospital radio service for the patients & staff of Neath Port Talbot Hospital in Baglan Moors. In 2005 the area was granted its first radio station when Afan FM, the inspiration of a group of local young people, was awarded a five-year licence by Ofcom to serve Port Talbot and Neath. Afan FM broadcast from the AquaDome leisure complex on Aberafan Seafront. Following a December 2009 fire at the AquaDome, Afan FM moved to Aberafan House, adjacent to the town's shopping centre. Afan FM closed in December 2011 was shut down following after an unexpected tax bill. The town has been served by several newspapers. The Port Talbot Guardian was a weekly paper published by Media Wales, part of the Trinity Mirror group, but ceased publication in October 2009. The Swansea-based daily South Wales Evening Post and the weekly Courier and Tribune are distributed in the town and are published by Media Wales, part of the Reach plc group. The Welsh-language song competition Cân i Gymru is usually filmed in Port Talbot. TV programmes such as Doctor Who and The Sarah Jane Adventures have filmed in the town. In April 2011, actor Michael Sheen led a 72-hour National Theatre Wales production of a modern retelling of The Passion. The play began at 5:30 am on Good Friday with a seafront scene, inspired by John the Baptist's baptism of Jesus, which was watched by hundreds who had heard about it by word of mouth. By the time the first main part of the play was performed on Aberafan Beach at 3:00 pm, organisers estimated up to 6,000 people had gathered to watch. On Easter Sunday, the production returned to Aberafan Beach as part of the finale. A trial was performed on Civic Square before a procession from Station Road, with the final scene, "the cross", at Aberafan seafront. By the time the procession had reached the seafront close to where it had begun 72 hours earlier, organisers estimate over 13,000 people had come to watch on the small roundabout. In April 2012, Michael Sheen returned to attend the world premiere of the feature-length film The Gospel of Us based on The Passion. The premiere was held at the Apollo Cinema (now the Reel Cinema) on the Aberafan seafront close to where The Passion took place. Tickets for the premiere sold out weeks before the showing; all six screens showed the film simultaneously. The film was also shown daily from Easter Sunday to the following Thursday prior to its UK-wide release the next day. Port Talbot is served by the South Wales Main Line at Port Talbot Parkway railway station. Great Western Railway and Transport for Wales serve the station with services westbound to Neath and Swansea and West Wales Line and eastbound to Bridgend, Cardiff Central and London Paddington. Trains also run via Hereford and Shrewsbury to Crewe and Manchester Piccadilly. The new £5.6 million Integrated Transport hub was completed in 2017, linking Port Talbot Parkway with new bus and taxi links. This also included extensive upgrades to the railway station and surrounding area. Port Talbot bus station, located adjacent to the Aberafan Centre in the centre of the town is the main bus transport hub, it is a National Express stop. Local bus services are provided by First Cymru and South Wales Transport. The bus station's layout is very distinctive for the fact that buses always have to perform a 270° clockwise turn to exit the station. A Sustrans cycle route has recently been constructed at this bus station as part of the connect2 scheme connecting the Afan Valley with Aberafan beach. 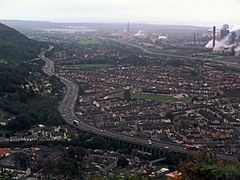 The M4 motorway cuts through the town from southeast to northwest, crossing a central area on a concrete viaduct, junctions 38 to 41 serve Port Talbot, with junctions 40 and 41 being in the commercial heart of the town. This busy urban stretch of the M4, with tight bends, two-lane carriageways, short narrow slip roads and concrete walls on both sides, was the first length of motorway in Wales when it opened to traffic in 1966. The road has a speed limit of 50 mph (80 km/h) enforced with a speed camera in the eastbound direction. The stretch through Port Talbot town centre is a particular traffic congestion blackspot and there have been calls to close the slip roads at junctions 40 and 41 to improve traffic flow. However some commuters oppose this plan since it would add more time to their journey. A new dual carriageway relief road, the Port Talbot Peripheral Distribution Road (PDR), was completed in 2013. It serves as a distributor road through Port Talbot to the southwest of the M4, beginning at M4 Junction 38 and ending near Junction 41. The Port Talbot Docks complex consist of an inner set of floating docks and an outer tidal basin. Construction of the tidal basin began in 1964 and the whole basin covers about 500 acres (200 ha). The tidal basin is capable of handling ships of up to 170,000 DWT and is used mostly for the import of iron ore and coal for use by nearby Port Talbot Steelworks. The inner floating docks were constructed in 1898 and were closed in 1959. They were re-opened in 1998 for commercial shipping and in March 2007 for the import of some steel products and are capable of handling ships of up to 8,000 dwt. There have been proposals for the development of an intermodal freight terminal at the port. On 20 November 2007, the Department for Business, Enterprise and Regulatory Reform (BERR) granted consent for the world's largest biomass power station to be built at Port Talbot. This is expected to provide enough electricity (from wood from environmentally-managed forests, mostly in North America) to supply half the homes in Wales with electricity. Potential future development currently centres around the peripheral distributor road to the south (the dual carriageway road in the Margam and Tiabach areas was finished in 2013), Baglan Industrial Park and Baglan Energy Park to the west, Port Talbot Docks to the southwest, Margam Country Park to the east and the Afan Valley to the north. In March 2009 Neath Port Talbot County Borough Council announced a regeneration project for Port Talbot town centre and docks, with a master plan for new homes, offices, light industry, retail developments and improvements to the railway station. In 2010, 26.2% of children and young persons (under the age of 20) were living in poverty. According to the Office of National Statistics between April 2012 to March 2013 25,400 (7.8%) between the ages of 16-64 were economically inactive, 60,100 (70.3%) between the ages of 16-64 were economically active. The unemployment rate was 7.8% and the employment rate was 64.9%. Port Talbot is home to a number of youth organisations. They are operated by Neath Port Talbot County Borough Council, the Ministry of Defence and a range of other charitable organisations. Neath Port Talbot County Borough Council operates youth clubs in Blaengwynfi, Bryn, Bryncoch, Cimla, Croeserw, Crynant, Cwmafan, Cwmllynfell, Cymmer, Glyncorrwg, Glynneath, Hengwrt, Neath, Sandfields, Seven Sisters, Taibach and Ystalyfera. The 499 (Port Talbot) Squadron Air Training Corps, Sea Cadets, Port Talbot Detachment and Dyfed and Glamorgan Army Cadet Force operate in Port Talbot. Port Talbot coastguard celebrated its centenary in 2008. The crew are the mud rescue team for the Swansea Bay area and are one of the seven rescue teams in the Gower Sector. Port Talbot inshore lifeboat is operated by the Royal National Lifeboat Institution and operates in the docks, at Aberafan Beach and in the navigable sections of the local rivers. Margam United F.C, based at the Saltings football field in Knights Road, Margam. The town is part of the Ospreys rugby union region, by which it is represented at the top level of the sport. Margam Forest to the northeast of the Port Talbot is used as a venue for a stage of the annual Wales Rally GB. In the past, the rally route has traversed Margam Country Park. Afan Forest Park to the north of the town has a number of dedicated mountain biking trails including the 'Penhydd', 'Y Wâl', 'Skyline', 'White's Level' and 'W²'. Port Talbot has an array of higher level football teams. Welsh Football League Division One teams Port Talbot Town F.C. and Afan Lido F.C. are based in the town while Goytre United F.C. is based just outside Port Talbot. The town's nearest professional clubs are Swansea City A.F.C., who play in the Championship, and Cardiff City F.C. who play in the Premier League. Martyn Ashton, British mountain bike trials former world champion and multiple British champion, lives in Port Talbot. Captain Beany, celebrity charity fundraiser, and celebrity lookalike. Robert Blythe, Welsh actor, was brought up in Tan y Groes Street. Played Fagin Hepplewhite in the BBC comedy High Hopes. Di Botcher, Welsh comedy actress. Rob Brydon, actor and comedian who was brought up in Baglan, Port Talbot. Richard Burton was born in Pontrhydyfen, Port Talbot as Richard Jenkins and had his early education in Port Talbot where he met his mentor, Philip Burton. Leondre Devries, part of the singing duo Bars and Melody who came third on Britain's Got Talent in 2014. Ivor Emmanuel, musical theatre and television singer and actor from Pontrhydyfen, Port Talbot. Peg Entwistle, successful Broadway theatre actress whose 1932 suicide from atop the Hollywood sign in Los Angeles forever tagged her as "The Hollywood Sign Girl" was born at 5 Broad Street, Port Talbot on 5 February 1908. Sir Anthony Hopkins, actor, was born and raised in Margam, Port Talbot. Geoffrey Howe was born in Port Talbot and spent his early years there. When he was made a life peer in 1992 he chose the title Baron Howe of Aberavon. Chris Jenkins British, European and World champion powerlifter. Lloyd Langford, former blacksmith turned comedian was raised in Port Talbot. Colin Pascoe, former Swansea City, Sunderland and Wales international. Dic Penderyn, was born as Richard Lewis in Aberafan in 1803, in the centre of what is now Port Talbot but before the town was named as such in 1840. He is buried at St Mary's Church, Aberavon, near the centre of the town. He was convicted of assault on an army soldier and executed. Mark Rees, author, arts journalist and broadcaster. Linda Sharp, champion surfer from Aberafan, won the European surfing championships twice, the British surfing championships ten times and the Welsh surfing championships 19 times. Rhys Taylor, footballer born in Neath on 7 April 1990. George Thomas, 1st Viscount Tonypandy was born in Tydraw Street, Port Talbot and was speaker in the House of Commons. Andrew Vicari, painter was born in Port Talbot. Freddie Williams, from Margam, was the 1950 and 1953 Speedway World Champion. As of 2013, Williams is the only Welshman to win the championship. In December 2018 the artist Banksy confirmed that he produced a mural painted on the corner of a garage close to Port Talbot steelworks. On one side it depicts a boy playing in what appears to be snowfall, but the other side shows the snowfall is ash falling from a bin fire. Port Talbot has several protected sites, including Sites of Special Scientific Interest (SSSI), Special Areas of Conservation (SAC) and a Ramsar wetland site. ^ a b "2011 Census". Nomisweb.co.uk. 27 March 2011. Retrieved 25 November 2013. ^ "Full text of "The itinerary of John Leland in or about the years 1535-1543. parts I to [XI]". Archive.org. Retrieved 6 September 2013. ^ a b John Davies; Nigel Jenkins; Menna Baines; Peredur I. Lynch, eds. (2008). The Welsh Academy Encyclopedia of Wales. Cardiff: University of Wales Press. p. 697. ^ www.oceannavigator.com Archived 27 September 2007 at the Wayback Machine article link not accessible. ^ "AB Ports web page for Port Talbot". Abports.co.uk. Retrieved 25 November 2013. ^ "Archive Network Wales: West Glamorgan Archive Service - Context". Anws.llgc.org.uk. Retrieved 25 November 2013. ^ "Local Government (Wales) Act 1994, County Boroughs". Legislation.gov.uk. Retrieved 25 November 2013. ^ "council details for Neath Port Talbot". www.southwalesguardian.co.uk. Retrieved 25 November 2013. ^ "Residents fight for beach access". BBC News. 26 August 2011. Retrieved 31 August 2018. ^ "Campaigners win beach footpath row". BBC News. 10 December 2013. Retrieved 31 August 2018. ^ "Port Talbot tops pollution chart". BBC News. 28 February 2005. Retrieved 12 May 2018. ^ "UK's most polluted towns and cities revealed". BBC News. 4 May 2018. ^ "Neath Port Talbot through time - Historical Statistics on Population for the District/Unitary Authority - Rate: Percentage aged 15-64". www.visionofbritain.org.uk. ^ "Neath Port Talbot through time - Historical Statistics on Work and Poverty for the District/Unitary Authority - Rate: Male Unemployment". www.visionofbritain.org.uk. ^ "Information about fossils: Glossary". Fossiel.net. Retrieved 6 September 2013. ^ "Ysgol Bae Baglan". www.baebaglan.school. ^ Coastal Housing plans for Glan Afan Comprehensive School site, Wales Online, 09 August 2016. ^ Parry, Gemma. (12 July 2016). School's out! Sandfields Comprehensive students and staff say goodbye to closing school. South Wales Evening Post. ^ "Seaside Social & Labour Club". www.seasidesociallabourclub.co.uk. ^ "The Motorway Archive. M4 in Wales - Coryton to Baglan". Iht.org. 22 July 1966. Archived from the original on 21 August 2009. Retrieved 25 November 2013. ^ "'End road chaos by closing M4 slip road' - icWales". Icwales.icnetwork.co.uk. 22 November 2007. Retrieved 25 November 2013. ^ "Top award for new Port Talbot road (2008)". walesonline.co.uk. 10 July 2008. Retrieved 25 November 2013. ^ "Associated British Ports News: Port Talbot Docks Handles First Steel Cargo For Nearly Four Decades". Abports.co.uk. Retrieved 25 November 2013. ^ "Associated British Ports: Port Facilities". Abport.co.uk. Retrieved 25 November 2013. ^ "£400M Wood Chip Plant Approved". BBC News. 21 November 2007. Retrieved 22 May 2010. ^ "NPT CBC - Port Talbot Consultation". Npt.gov.uk. 15 August 2013. Retrieved 25 November 2013. ^ "Public Health Wales Observatory" (PDF). Retrieved 15 December 2017. ^ "Neath Port Talbot". Retrieved 22 May 2010. ^ "Port Talbot Lifeboat Station". Rnli.org. 28 August 2013. Retrieved 6 September 2013. ^ "TS Multisport Home". TS Multisport. Retrieved 19 September 2018. ^ "BBC - Wales - Nature - surfing mini site - Surfing at Aberavon". www.bbc.co.uk. Retrieved 22 December 2017. ^ "(Peg Entwistle)". www.thehollywoodsigngirl.com. Archived from the original on 10 February 2012. Retrieved 25 November 2013. ^ "(Mark Rees)". www.walesonline.co.uk. Retrieved 7 February 2019. ^ Steve England (July 2004). "Carve Greatest British Surfer poll". Surfers Village. Retrieved 15 February 2010. ^ "(Richard Winpenny)". www.manchester.ac.uk. Retrieved 25 November 2013. ^ "(Richard Winpenny)". www.psi.manchester.ac.uk. Archived from the original on 27 October 2013. Retrieved 25 November 2013. ^ "Banksy confirms Port Talbot 'Season's greetings' piece is his". BBC. Retrieved 20 December 2018. ^ "Natural Resources Wales / Designated sites". naturalresources.wales. Wikivoyage has a travel guide for Port Talbot. Wikimedia Commons has media related to Port Talbot. "Air Quality Website". Neath Port Talbot Council.